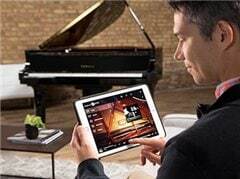 The pinnacle of reproducing technologies, the ENSPIRE PRO offers the highest resolution recording and playback paired with the highest quality acoustic pianos for those who want nothing but the best. Wireless network connectivity and seamless compatibility with mobile devices, smartphones and computers allows intuitive access to all of the instrument's exclusive content and unique capabilities. 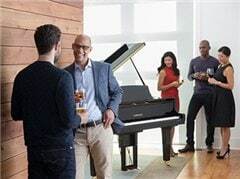 The Disklavier ENSPIRE allows you to revel in whatever music suits your mood or occasion, from classical solo piano or concerto selections to your favorite jazz or pop songs on piano - accompanied by audio and vocals. 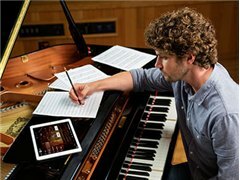 An easy-to-use and intuitive UI design provides direct access to 500 built-in songs* and thousands performances that can be downloaded directly to the instrument from the Yamaha MusicSoft online store. Disklavier ENSPIRE features popular, award-winning and legendary Yamaha artists such as Sarah McLachlan, Bob James, and Jamie Cullum*. 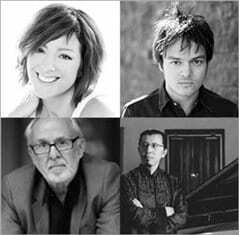 These performances are not simply a rendition of the artist's songs, but exclusive performances by the actual artists themselves, recorded specifically for ENSPIRE. Experience the genuine touch, nuance and emotion as the instrument recreates a precise portrayal of the artist's intentions. The Disklavier ENSPIRE is the only piano that can truly reproduce every nuance of a piano performance, precisely recreating all of the details that other player pianos cannot. For example, a player's key release timing controls the exact timing of each individual damper coming down on the string and contributes to the overall musical message that the pianist is trying to convey. 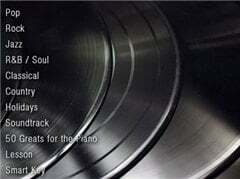 Other player systems rely on predetermined programming to control the release of the piano keys, which results in every key releasing at the exact same speed during playback. This programming equates to half of the original performance being altered, which means half of the human element of the piano performance is removed. The Disklavier, by contrast, can reproduce all articulations of the performance, including the speed by which a key is released, meticulously reproducing what even other high-end systems cannot. Couple these unmatched reproducing capabilities with advanced AccuPlay DSP technology, and you have a piano that not only recreates every nuance of the original performance, but is intelligent enough to verify and adjust itself during playback to ensure accurate performance reproduction. The Disklavier ENSPIRE PRO is the only instrument with fully integrated high-resolution recording and playback functionality capable of capturing and reproducing 1024 dynamic levels of key and hammer velocity, as well as 256 increments of positional pedaling. Equipped with a cutting-edge optical sensor system that precisely captures every nuanced movement of the keys, hammers and pedals, the ENSPIRE will precisely reproduce the speed of each hammer as it strikes the string, the finest detail of your pedaling, and even the velocity of your key release. Extremely accurate recording functions allow teachers and students to critique recorded performances - providing new ways for students to enhance their musical development. Proprietary video sync technology gives users the ability to create, archive and share an acoustic piano driven visual performance using just the piano and a video camera. Yamaha SILENT Piano™ technology allows you to listen, learn and play without being disturbed or disturbing others. 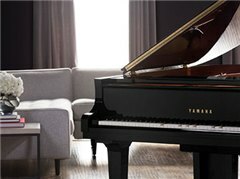 Utilizing a unique sampling technique that replicates the interaural characteristics of the human ear, the Disklavier ENSPIRE binaurally recreates the sound, presence and resonance of a Yamaha CFX Concert Grand from the player's position through headphones. This innovative technology is built into every ENSPIRE ST and PRO model Disklavier, giving you increased flexibility and more opportunities to enjoy your piano.